An abstract is a history of the property title as revealed by the public records. Abstracts may contain errors and do not disclose “hidden hazards” that can threaten your property title if you do not have a title insurance policy. If a claim is made against your property, title insurance will, in accordance with the terms of your policy, assure you of a legal defense and pay all court costs and related fees. Also, if the claim proves valid, you will be reimbursed for your actual loss up to the face amount of the policy. Not necessarily. A deed is just a document by which the right of ownership in land is transferred, whatever that right may be. It’s not proof of ownership, and it doesn’t do away with rights others may have in the property. In addition, a deed won’t show you liens or claims that may be outstanding against the title. The Patriot Act requires that we collect a photocopy of your valid government issued picture I.D. such as a Driver’s License, Passport, or Military I.D. Additionally, if you are bringing money to the settlement these funds will need to be “certified funds”. Certified funds can come in the form of a cashier’s check, teller’s check, money order, or certified personal check. Cash is only acceptable in small amounts. Please call our office in advance if you intend to bring cash to the settlement. Your lender will require that the purchaser bring proof of homeowner’s insurance. Your lender may also require a current Wood Destroying Insect or Termite Report. You may also be required to bring additional documents which our office will inform you of in advance. How long can I expect my closing will take? While the time of a settlement can vary greatly, typically a refinance will take about 30 minutes and a purchase will take about 45 minutes. At what point should I contact Southern Title to handle my closing? If purchasing, you should contact Southern Title as soon as you have a signed contract. By contacting us as early as possible, you allow us adequate time to obtain a title abstract on the property being purchased and clear any outstanding “clouds” on title prior to your contracted settlement date. Additionally, we can better coordinate the settlement with all parties involved including the sellers, purchasers, real estate professionals, and lenders. If refinancing, you should contact us after you submit your loan application. Do not wait for final loan approval, as the time between your loan approval and settlement is often only a few days. By scheduling with us early, you allow us time to obtain the title abstract and clear any issues with your title, obtain payoffs from your current lender, and coordinate closing with your new lender. What should I do if I cannot attend the closing? In certain circumstances, a “power-of-attorney” can be prepared for you. A “power-of-attorney” is a legal instrument which allows another to sign legal documents on your behalf. Please give us a call to discuss this if you will not be able to attend. At a “purchase settlement,” typically the sellers, purchasers, and their real estate professionals will attend the closing, which will be conducted by one of our competent and experienced attorneys or settlement officers. At a refinance settlement usually only the borrowers and our attorney or settlement officer are present. When can I find out how much money I need to bring? Because we rely on third parties such as lenders to provide us with instructions, information, and figures for your settlement, we often cannot furnish to you the exact amount you need to bring to closing until the day before, or, sometimes, even the day of settlement. However, you should be able to rely on your lenders or your realtor’s good faith estimate for the approximate amount of money you need to bring with you. If you happen to bring too much money to settlement, we refund back to you any excess amount upon completion of the closing. Obtaining your insurance early will assist the lender in determining escrows which can speed up the ability to provide an accurate settlement figure. 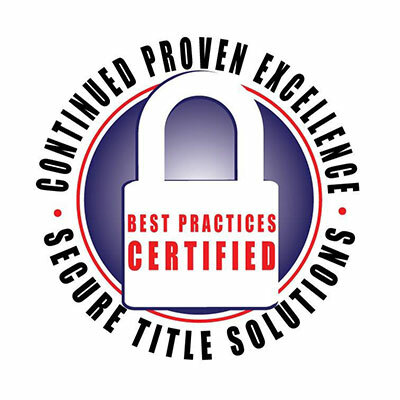 Title insurance provides valuable protection for property buyers. Like all forms of insurance, however, it does not cover every conceivable problem and it is important to understand its limitations. Title insurance is based on examination of the county real estate records, and generally will not cover problems arising from facts outside of the recorded chain of title. One common problem not covered by title insurance is boundary line issues, which would be revealed by a survey of the property (for example, it turns out that your fence is actually two feet onto your neighbor’s property). Unrecorded mechanics’ liens and unpaid public utility bills are other examples. The title insurance policy will describe many of the situations it does not cover; these same limitations will generally be found in an attorney’s title examination. A qualified real property attorney can assist in helping a buyer understand the limits of a title policy and can take care of issues not covered by the policy. A lien is any legal claim on real property that acts as a security for the payment of a debt or other obligation. If the debt is not repaid as promised, the lender or the lien holder can foreclose its claim on the property and force a public sale to pay the debt. The most common form of a lien on the property is a mortgage. While all mortgages are liens, not all liens are mortgages. Other types of liens are commonly encountered and part of the work of the real property attorney is to check for outstanding liens at the time a real estate transaction closes. These include such things as judgment liens resulting from a court judgment against the owners, mechanic’s liens resulting from recent improvements to the property, liens for unpaid taxes, and liens for unpaid municipal utilities such as water and sewer. Often, if a seller is divorced, the divorce decree will provide the ex-spouse with a lien on the couple’s property to be paid at the time of sale. Mechanic’s and material men’s liens exist in most states to provide special collection rights to persons and businesses that make improvements to real property. They are of particular concern to the purchaser of real property, as the seller may have had significant work done on the property in anticipation of the sale. If the seller has not yet paid for that work, mechanic’s liens can result. The definition of mechanics and material men usually includes anyone who provides services such as carpentry, plumbing, painting, and the like, as well as anyone who supplies building materials and supplies for the project. On any given project, the general contractor, the subcontractors, and the lumberyard and other suppliers will have mechanic’s lien rights. Some states also grant these rights to professionals such as architects, engineers, and surveyors. The laws governing mechanic’s liens vary greatly from state to state. Commonly, however, the contractor has the right to serve the owner of the property with a lien claim or notice of lien and to record it as part of the county land title records when payment is not made for materials or services provided for the improvement of real property. If the lien is not paid, the contractor can commence a court proceeding to foreclose the lien and to sell the land in payment of the obligation. In some states, the contractor is required to file a notice of lien or to provide the owner with notices relative to the possibility of a lien, prior to commencing work on the property or supplying materials. Usually, the time for filing a mechanic’s lien is short; commonly the lien must be filed within sixty to 120 days of the last day of work on the property. Mechanic’s liens are of special concern, because in certain circumstances, they can result in an owner being forced to pay twice for the same work. Commonly, this occurs when the owner pays the general contractor in full for the work in advance. If the general contractor then fails to pay his subcontractors, the subcontractors may still have the right to file a lien and force the sale of the property if they are not paid. The fact that the owner has already paid the general contractor for the work may not be a defense. This problem can be prevented by obtaining mechanic’s lien waivers from all materials suppliers and subcontractors prior to full payment. What is a contract for deed or land installment contract? By far the most common method of financing the purchase of real property is a traditional promissory note secured by a mortgage. Some states, however, provide for an alternative financing method, most commonly used in transactions between private parties, called a contract for deed or land installment contract. At the risk of oversimplifying, such a contract looks like a purchase agreement contract but effectively acts as a mortgage. In a traditional mortgage finance transaction, title to the property transfers to the buyer on sale. The buyer borrows the money to pay the seller in full, and then gives a mortgage back to the lender. With a contract for deed, however, the title stays with the seller. The contract will provide for a purchase price and monthly payments, and provide that if the buyer completes making the specified payments, the owner will then provide the buyer with a deed to the property. Contracts for deed are often used for short-term financing (of a few years or less) and may contain a balloon payment clause. The contract is then said to balloon on a specified date at which time the entire outstanding and unpaid balance of the purchase price will be due and payable. The hope is that the buyer will be able to use the contract period to find and qualify for financing. In those states that allow them, terminating contracts for deed or land installment contracts is frequently easier and faster than foreclosing a mortgage. If the buyer fails to make the required payments (including any balloon payment when due), the seller can cancel the contract, usually by serving notice on the buyer. If the buyer fails to cure the default within the time provided by statute, he or she can lose the property and any money paid to date. Adverse possession is a right to use or own property that is the result of continued use and occupancy over a period of time, generally ten to twenty years depending on the state. If a non-owner of property occupies and uses the property without the permission of the actual owner for long enough, the law will find that the actual owner has lost his or her rights in the property and ownership has transferred. Since the doctrine of adverse possession results in taking property without payment, the principle is applied very carefully by the courts and only if certain specified conditions are met. Thus, for example, the adverse use must be obvious to the real owner. And the use must be hostile, meaning that it is without the permission of the real owner. Use of another’s property with the permission of the owner will never create a right of adverse possession. Adverse possession issues arise most often where an adjacent property owner encroaches on a neighbor, although they may also arise in other situations. For example, assume your neighbor erects a fence three feet onto your property, preventing you from using that space, and starts using the land as a garden. Obviously, as owner you would have the right to remove the fence and the garden. Or, you could sign an agreement with the neighbor allowing him to use the land with your permission for a specified period of time. But, if as owner you took no action, and the adverse use continued for the specified number of years, the neighbor could come to actually own that portion of the property. For this reason it is important when purchasing property to check for encroachments and adverse uses, and conduct a survey if there is any question as to where the property lines actually are. The theory behind state and local zoning ordinances is that uses within a particular area should be uniform. While this system generally works well, obviously there will on occasion be the need for exceptions to the general rule. Depending on the needs of the individuals involved, and the impact on the neighborhood as a whole, it may be possible to change the zoning on a particular property by obtaining a variance. A variance is a permission to depart from the requirements of a zoning ordinance in one or more particulars. Generally, a variance request is granted or denied through administrative action. Variances can be divided into area variances and use variances. An area variance may be requested where the use is permissible, but does not quite fit the property. For example, if an owner wanted to add a deck to his or her home that would violate the minimum setback requirements of the zoning regulation, or wanted to build a two-story garage, which exceeded the height requirement, an area variance would be required. By contrast, the use variance relates to a use of the property that is otherwise impermissible in the given zone. If for example, a landowner wanted to build a grocery store in a locality zoned exclusively for residential purposes, a use variance would be required. Generally, a use variance will be harder to obtain than an area variance. The landowner requesting the variance must show an undue hardship that is not self-imposed and must demonstrate that the variance would not harm the public welfare, have not an excessive impact on the general zoning plan, or would not adversely impact surrounding property values. The requirement that any hardship is not self-imposed is of particular significance. The purpose of this requirement is to prevent an owner from building a nonconforming structure and then seeking a variance for it on the grounds that it would be a hardship to tear it down. What does it mean when something is said to be grandfathered in for zoning purposes? One goal of zoning is to separate property uses into distinct zoning districts (residential, commercial, industrial, etc.) and to keep uses within each zone uniform. For example, if a district is zoned for residential use, no businesses will normally be permitted to open there. But, what happens to a business that existed and was operating prior to the time when its location was zoned residential? At this point, the constitutional prohibition against taking property without just compensation comes into play. If a use predates the zoning plan, it will be permitted to remain, because the government lacks the power to simply close a business in a zone that becomes residential, or require a home in an industrial zone to be torn down, unless it is willing to compensate the owner for the loss. Such exceptions are called nonconforming uses. Commonly, the portion of the zoning statue allowing prior nonconforming uses is called a grandfather clause and such a use is said to be grandfathered in. Nonconforming uses, however, are not exempt from all zoning regulation. While they cannot be taken (without compensation), the government is not required to allow them to change or expand. The use is generally limited to what existed when the zoning ordinance was adopted. Also, if the nonconforming use is abandoned or ceases, the grandfather rights are lost, and the nonconforming use cannot be restarted at a later date. Under many laws, if a nonconforming structure is destroyed by fire or other cause, it may not be rebuilt. The hope is that with these restrictions in place, nonconforming uses will decrease and cease over time. I’ve heard about people who have made money by buying property cheaply at mortgage foreclosure sales and then reselling it at a profit. What does this involve? Is it something I could do? There are indeed companies and investors who specialize in buying foreclosed properties and make money doing so. This is, however, an extremely high-risk form of investment that is definitely not for the inexperienced or faint of heart. Consider the differences between a sheriff’s sale and a standard real estate purchase. In a normal sale transaction, the seller gives the buyer an opportunity to inspect the property and provides promises and warranties regarding the title. These promises are in turn generally backed up by a title insurance policy or an attorney’s title opinion. In a sheriff’s sale, none of these safeguards exist; the rule is caveat emptor, or let the buyer beware. The deed that the sheriff conveys to the purchaser has no covenants, warranties, or representations of any kind, and the purchaser generally has no recourse if there is something wrong with the title to the real estate. Another major problem with purchasing at a sheriff’s sale is that there is little or no opportunity to inspect the property prior to the sale. In general, the delinquent borrower still lives in the property at the time of the sale and may be at best uncooperative (and at worst downright hostile) if asked to allow inspection by a prospective purchaser. Moreover, in many states the borrower will be allowed to remain in the property for some period of time after the sale (the redemption period); this is often up to six months and sometimes as much as a year. During this period, the borrower obviously has no incentive to maintain the property, pay taxes, or utility bills, and may actually be antagonistic enough to deliberately damage the property. These problems explain why the mortgagor/lender is usually the only bidder at a sheriff’s foreclosure sale. With experience and the assistance of competent counsel, a purchaser can indeed successfully obtain good title to property, often at bargain prices, through the foreclosure sale process. But this is an activity best left to those with expertise in the area and a high tolerance for financial risk. Must I buy title insurance when closing a real estate transaction? There is no requirement to buy title insurance. But, realistically, most mortgage companies, banks, and credit unions will require title insurance to protect their interest in the property. However, it is recommended that you do purchase title insurance unless you have fully investigated the condition of title and are willing to accept the property with the liens and restrictions shown. While simple real estate transactions may be handled without a lawyer, you may want your own attorney to clarify any terms that are unclear to you in any documents you are being asked to sign. You may also need sophisticated tax or real estate advice for more complex real estate transactions. Can I “Shop Around” to find a better deal on my title insurance? Not really. Title insurance rates in Louisiana are regulated by the state’s insurance commission and will not vary from one title company to another. However, slight variations in a title insurance quote can occur if a lower degree of coverage is offered. Premium amounts are based upon the purchase price and loan amount of the mortgage. What is a Settlement Statement? What is shown on it? A HUD-1 Settlement Statement is a government-regulated form provided by the title company (closing agent) that itemizes all fees and charges for the buyer and seller and gives full disclosure of all monies involved in a real estate transaction. Some of these fees and charges might include: contract purchase price, agent commissions, lender fees for the loan, insurance, title company charges, abstract of title, property taxes, surveys, and recordation fees. The settlement statement outlines your debits and credits and provides each party with a “bottom line” figure. For a more detailed description of the HUD-1 Settlement Statement see this link. What is a Homestead Exemption? What do I have to do to get it? A properly filed Homestead Exemption reduces the amount of money homeowners must pay for their annual property taxes. The homestead exemption of each Parish varies, but filing for one can save hundreds of dollars. Property owners are allowed only one homestead exemption – for their primary residence. Homestead Exemptions on investment property are not allowed. To file for the homestead exemption, bring a copy of the recorded Act of Sale where you acquired your home to your Tax Assessor’s Office. Filing for the exemption is done in person the first time. Either you or your spouse can do it – it is not necessary for both of you to be there. Each year thereafter, a postcard is mailed to your home for renewal. Generally, this rule allows for a like-kind exchange of investment property with capital gains taxes being deferred into the future, as long as certain steps are followed within the required timelines and the use of the property is within allowable guidelines. Does my property qualify for a 1031 Exchange? Many types of property can be used in a 1031 exchange, including raw land, residential or commercial rental, industrial, certain leasehold interests, a farmer’s farm, a doctor’s own office and percentage ownership in investment property. Any real estate for real estate will do, as long as it is held for investment or used in productive trade for business. Not all properties qualify for a 1031 exchange, however. Properties held by a developer as inventory, dealers in property, securities or other evidence of indebtedness or interest, stocks, bonds &notes, certificates of trust or beneficial interests or any interest in a partnership are all outside the scope of 1031 exchanges and do not qualify for tax-deferred treatment. In addition, essentially all personal use property will not qualify for 1031 exchange treatment. The safest course of action is to assume that if you use the property for yourself, then you cannot exchange it. How long do I have to complete the 1031 Exchange? A 1031 exchange has two key timing conditions. The first condition is that a qualifying like-kind replacement property is “identified” within 45 calendar days of the closing for the relinquished property. The identification requires a written notification to the Qualified Intermediary listing the addresses or legal descriptions of up to three potential replacement properties. The second condition is that the purchase of the replacement property must be completed within 180 calendar days after the close of the relinquished property. After the 45 calendar days has passed, the exchange may not change their Property Identification List and must purchase one of the listed replacement properties or the exchange fails. Because of the strict calendar day requirements, after the initial 45 calendar day identification period, the exchange has only 135 calendar days to complete the exchange or else it will fail. Holidays and weekends do not stop the clock. The IRS is very strict on this point and it is a common source of failed exchanges. The 1031 exchange must show on the same year’s tax return. If the taxpayer is unable to complete the exchange in the same tax year, then the person will have to request an extension to complete the exchange prior to filing your tax return. Why use a 1031 Exchange? The main point of a 1031 tax deferred exchange is that capital gains taxes on real estate held for investment can be deferred indefinitely if the owner of qualifying property exchanges, rather than sells it. The savings from the exchange will vary by the size of the investment, your own income and other factors (such as state tax rates). Under certain circumstances, this rate can be as high as 20%, with an additional 3.8% passive income tax for high-income households. What is a Like-Kind property? Replacement property acquired in an exchange must be “like-kind” to the property being relinquished. All qualifying real property located in the United States is like-kind. Personal property that is relinquished must be either like-kind or like-class to the personal property which is acquired. Property located outside the United States is not like-kind to property located in the United States. What is a Simultaneous Residential Exchange? Using a rare straightforward exchange of residential property, we would follow the process of identifying the replacement property, so the entire process of selling the relinquished property, holding the sales proceeds in escrow, transferring the sales proceeds to the seller of the replacement property, who then transfers the replacement property’s deed to the exchange is more or less instant (can occur as multiple closings in one day). What is a Delayed Forward Exchange? The delayed forward exchange is similar to the simultaneous exchange in general flow: an exchangor sells his property (the relinquished property) to a buyer, whose cash is held in escrow by Southern Exchange Services, acting as the QI under an agreement with the exchangor in this example. When the seller of the replacement property sells to the exchangor, Southern Exchange Services releases the cash to him, and he gives the exchangor the deed to the new property. The difference is that there is a time delay between when the relinquished property is sold and when the exchangor acquires the replacement property (as the exchangor has to identify suitable like-kind property). What is a Build-to-Suit Exchange? The build to suit exchange is more complex than either the simultaneous or delayed exchange because it requires building a new structure or renovating an existing structure that is like-kind to the relinquished property. This construction period generates additional requirements to oversee construction with the funds form the relinquished property sale. Typically this process requires another entity not found in the standard 1031 exchange contracts, an Exchange Accommodation Titleholder (EAT), acting as the Holding Entity, that receives a fee interest in the replacement property to allow it to perform its construction duties using proceeds from the sale of the relinquished property. What is a Delayed Build-to-Suit Exchange? In a delayed build-to-suit exchange, the process is essentially identical to that of a build-to-suit exchange, except that a time delay exists between the sale of the relinquished property and the identification and construction start of the replacement property. The reverse exchange is the opposite of a delayed exchange in that instead of selling the relinquished property first,the replacement property is acquired first, then the relinquished property is sold. This type of exchange has both “safe harbor” and “non-safe harbor”varieties, though the “safe harbor” varieties are more common (in fact, there may be some difficulty with having a non-safe-harbor reverse exchange recognized by the IRS as the regulations are not clear on this point). What is a Bond for Deed? A Bond For Deed (BFD) is defined as a contract to sell real property in which the purchase price is to be paid by the buyer; to the seller in installments; and in which the seller after payment of a stipulated sum agrees to deliver title to the buyer (very similar to what some other states call a conditional sale or land contract). Simply put seller financing with different rules than when you give the title and take back a lien. If the buyer under a BFD contract fails to make payment in accordance with its terms and conditions to the seller; the seller may have the BFD contract canceled by the proper registry in the mortgage and conveyance records. The seller must first give 45 days prior notice via registered or certified mail to the purchaser of his intent to cancel if all amounts due have not been paid. This default notice requirement is mandatory and may not be waived. What is the role of an Escrow Agent under a Bond for Deed Contract? The role of the escrow agent in a BFD contract depends upon the needs of the purchaser and seller. The main function is to collect and remit payments to either the seller or mortgage holder, or both. NOTE: There are only eleven (11) licensed escrow agents in Louisiana. The way this is done at Southern Title, Inc. is to collect the payments from the purchaser on or before the 20th of each month. The reason this is done is to provide enough time for a check to clear and a payment to reach the mortgage company before the 1st of the month. A 5% late fee is charged if the payment is not received by the 20th, and the late fee is increased to 10% if the payment is not received by the 1st of the month. What happens if the Purchaser defaults on the Bond for Deed Contract? The seller must also be aware that if the purchaser defaults on their obligations under the BFD contract, they will need to come up with approximately two months of mortgage payments in order to bring their mortgage current. It is best to bring a payment before the first of the month so that the payments are not late. The purchaser has forty-five days after default to bring the payments up to date, and those two months of missed payments will have to be paid by the seller if the purchaser cannot cure the default. Generally the seller in a BFD purchase receives a cash payment for their equity at the closing, and their real estate agent may recommend that they make sure to save a portion of these sums in case of a problem or deposit sums with the escrow agent to be used to keep a mortgage current in case of default. In a situation where a buyer defaults after placing a large cash payment at the closing, it is possible that the seller may have to reimburse the purchaser some of that money. It is considered against public policy to allow one party in a contract to be unjustly enriched in this manner. The actual amount would, of course, be reduced by costs associated with the sale and loss of opportunity to sell the property, so it would have to be a large cash sum to require any sort of reimbursement. There is also a recent bankruptcy case where the Trustee went after the seller to get a portion of the down payment back. It is possible that a buyer who was about to default on their BFD contract would damage or vandalize the property before they were evicted. In our experience, this is an extremely rare occurrence. Sometimes the purchaser has in fact improved the property. This is also an issue for anyone who rents property and is something the real estate agent should keep in mind. What benefits does a Purchaser have entering a Bond for Deed Contract? There are benefits to a buyer in a BFD transaction. The purchaser is able to deduct the interest portion of their payments on their federal income taxes. Their agent should make their purchaser aware of this advantage. The escrow company will send a 1098 interest statement to the buyer on or before January 31st of the following year. Purchasing property by BFD can be significantly cheaper than acquiring financing thru a lending institution. There are no mortgage company fees, such as appraisals,credit reports, origination points, and so on. This can save the purchaser thousands of dollars. It is also much cheaper than doing an assumption of a mortgage, where many of the same fees apply. There are also no lender approval issues. The contract is negotiated between the parties and is not dependent upon locating the proper financing. This makes the process much quicker and more certain. Since there is not an issue of Lender approval, the buyer can have less than perfect credit and still execute a bond for deed contract. The agent should make certain that the buyer will be able to make the monthly payments, but concerns like a past bankruptcy or other credit problems will not prevent a sale. A purchaser in a BFD contract is building equity in the property they are purchasing. There is a pride of ownership and sense of community instilled in the buyer. In many cases a BFD purchaser is someone who has never owned a home prior to this transaction, and would not have been able to acquire the financing to purchase a home in a conventional manner. The purchaser is now a property owner, and is not merely leasing the property. The purchaser may sell the property at any time, so long as there are enough funds available to pay the sums due under the BFD. What benefits does a Seller have entering a Bond for Deed Contract? A seller can also use a BFD to sell property that is dilapidated or for whatever reason has little value as collateral. It can be difficult to sell the property where a buyer cannot obtain the necessary financing. The purchaser can repair the property and then acquire the financing to pay off the BFD. Another benefit is that if a buyer defaults on their obligations, the seller can quickly and cheaply reclaim their property. Forty-five (45) days after the default letter is sent to the purchaser via registered or certified mail the owner may institute an eviction proceeding. This is significantly faster than to foreclose on a credit sale or other form of a mortgage. It is also much cheaper than going to a sheriff’s sale. What are some things I need to consider in choosing a commercial space? Depending on the type of business and how it operates, there are a number of considerations in selecting a commercial site. These factors may be of great importance: location, cost, zoning restrictions, access, visibility, available signage and parking. How are lease rates calculated for commercial property? Commercial property lease rates are typically based on the annual cost, per square foot, of the leased space. In order to determine the monthly, rent for a property, you would need to multiply the quoted rent per square foot by the number of square feet being leased. The resulting number is the annual rent. The annual rent should then be divided by twelve to arrive at the monthly rent figure. What is the difference between a gross lease and a net lease? Gross and Net leases are two different ways of quoting rent. A gross lease means that the stated rental rate includes the major expenses from real estate taxes, property insurance and common area maintenance, and that no additional rent for those items is required to be paid. With an absolute gross or full service lease, the rate will include basic utilities. A NNN or triple net lease is where the rent is quoted as a base rent net of, or not including, the expenses for real estate taxes, building insurance and common area maintenance. These expenses are an extra charge over and above the base rent, as well as the utilities. A tenant will typically pay for its own phone and internet services under any of these lease types. Common area maintenance (CAM) typically includes the costs of common utilities, land maintenance, janitorial services, etc. Tenant improvements are the remodeling or maintenance that need to be completed before the tenant can utilize the leased premises. A reverse mortgage is a non-recourse loan that allows homeowners aged 62 and older to convert home equity into cash or as a means to purchase a new home without having to worry about paying a monthly note. The primary requirements for a reverse mortgage are simple: be 62 or older and have equity in a principle residence. There are a few other requirements prior to closing, too. The borrower must attend a third party counseling session by an HUD-certified nonprofit agency that is designed to protect seniors. The lender will have an FHA appraisal done on the property to determine its market value. What parties are involved in a Reverse Mortgage? There are always at least three parties involved in a reverse mortgage: a borrower, the lender and the title company. Frequently, real estate agents are involved in providing guidance to the homeowner borrowers as well. The borrower is the owner of the principle residence who would like to convert his / her home equity into one or more tax-free cash payments to be used for essentially any purpose. The lender is the financial institution that agrees to lend the borrower money in exchange for a mortgage on the property. The lender will not require any payments from the borrower. The lender pays the borrower. The title company’s role is to facilitate the transaction by verifying compliance with all closing rules and regulations, having the borrower and lender sign relevant paperwork, and by holding the loan proceeds in escrow until all paperwork has been completed. The agent’s role in the process is to provide objective guidance for seniors who may be good candidates for a reverse mortgage. This guidance involves determining the client’s needs and potential qualification level, a market value of the existing residence, and finding an appropriate new residence for them (if applicable). What are other Non-income reasons to enter into a Reverse Mortgage? These factors help to support the economic logic of entering into a reverse mortgage for particular types of seniors. In order to understand Louisiana inheritance law, you need to be familiar with the legal term USUFRUCT. The word is easier to understand if you think of two common English words, “use” and “fruits”. Often in our state, one person will inherit the right to use property while another will inherit the right to sell or mortgage property. A house is a perfect example. One person may have the right to live in the house. Another person may have the right to sell the house. This other right is referred to as “naked ownership.” While the naked owner can sell the house, it would have no effect on the usufruct. A succession is a process of settling a deceased person’s estate and distributing the property after debts are paid. This process is called probate in other states.Succession is also used to refer to the estate a person leaves behind at death. A succession can be either intestate (without a will) or testate (with a will). Why are successions relevant to real estate professionals? What is the difference between intestate and testate? Intestate Succession occurs when there is no will or when the will is invalid in whole or in part, or the will does not dispose of all the decedent’s property. It’s opposite, testate indicates that the deceased had a valid will prior to death. In Louisiana, the law provides for the disposition of the assets in the absence of a will. Intestate successors are commonly called “heirs” while testate successors are commonly called “legates”. Additionally, a court-appointed administrator the person in charge of the estate when someone dies without a will, while an executor is specifically named in the will to take charge of the estate. Inheritance basically refers to the transfer of property and wealth from a person who has died to a descendant who is still living. If a person dies without a will having left offspring, all of his succession, whether community or separate property, passes to the offspring. If one of his children has predeceased the decedent leaving children of their own, those grandchildren of the decedent inherit by representation, meaning that they inherit and will split the share that their parent would have inherited. It is often assumed that the surviving spouse inherits a 50% interest from the decedent.This belief is incorrect because the surviving spouse does not inherit anything from the decedent if there are children and no will. If there are no children, then the surviving spouse will inherit the decedent’s portion of community property. A will could create any number of new rules of who will or will not inherit. Does all property have to go through a succession? Some types of property are not considered part of your succession in Louisiana. Normally, a property that is paid directly to a named payee by a third party is not subject to succession laws. For example, any retirement asset, like an IRA or 401(k), would not have to go through succession and would not be subject to inheritance tax. It is important to make sure your beneficiary designation/s are up to date. What are the requirements for a succession? 1. All successions must be opened in the parish of the deceased’s domicile, which combines both an intent to remain in a place + physical presence. 2. If a person was not domiciled in Louisiana the succession may be open in a parish where the deceased had immovable property. 3. If a person was not domiciled in Louisiana and owned no immovable property, the succession may be open in any parish where the deceased movable property is location. What information is needed for a succession? A list of all the assets the decedent had when he died, a determination of whether those assets were community property or separate property of the decedent, and the value those assets had on the day the decedent died, a list of the debts the decedent owed when he died, a list of the funeral and burial expenses. For any real estate, the attorney will need a formal legal description of the property, which can be found in the act by which the decedent acquired ownership of the property. If you do not have that document, it can be retrieved from the property records of the parish where the property is located. If the property is covered by a mortgage, that mortgage must also be listed. What should I do right away if someone close to me has died? The first thing you should do when someone dies is to preserve the information that will be needed to conclude the succession. This information consists of information about the decedent, such as the date he died, where he lived when he died, whether he executed a valid testament before he died, who are his heirs or legatees and what property and liabilities did he leave behind. A good practice is to gather together in one place all of the bills and bank statements that are received in the mail over the next 30 days or longer. If the decedent had any stock, bonds or other securities, it would be useful to retain a listing, such as a newspaper listing, of the quotes for the day he died. It is also important to retain all of the bills for the funeral and burial. These bills are considered “administrative expenses” of the succession and are treated differently from all other bills that the decedent had at the time he died. If the decedent had pre-paid his funeral expenses, you should retain those records. What is a testate succession? Any person who has an interest in the will may request probate. File petition praying that testament is probated and executed; attached thereto is the affidavit of death, domicile and heirship and will is present. Wills in a valid form in Louisiana may be proved by an affidavit (olographic or notarial). 1. Any person who has an interest in the succession may petition the court for probate and execution of the will. 2. Petition the court for probate and execution of the will. 3. The petitioner must submit proof of death (affidavit of two people having knowledge of the facts sworn to). 4. Wills are generally probated without objection or opposition. How is a succession administered? 2. Most successions avail themselves of the exception to the rule and do not follow the complete administration procedure. 3. With any succession under administration, the estate sells the property through an administrator. The title does not vest in any of the heirs. This is a useful alternative when you have heirs that have judgments against them, heirs who are minors or heirs you cannot find. The typical administration of a testate succession is through the Process Verbal: the Proces verbal prepared, or if will be provided by affidavit, then the judge signs the order. The Process verbal is a public inventory of succession property taken by a court-appointed notary in the presence of two witnesses. The will is then ordered and recorded, filed and executed. What is intestate succession under administration? The succession representative is referred to as the administrator. Any interested person may petition the court to be notified about application for appointment of administrator. Court shall appoint a qualified applicant having the highest priority. What is testate succession under administration? Succession representative referred to as executor. The deceased in the will appoints the executor. The court has the power to remove a succession representative. The timing of the executor’s appointment, letters issued testamentary and disqualification is issued as well. What is an example of a small succession under administration? 1. Gross Estate of the decedent must be under $75,000. 2. The court will appoint Administrator. NOTE – the first one who asks usually gets the appointment and there can be more than one administrator appointed as is often done when the deceased has children from different marriages. 3. Newspaper ads are run advertising the sale’s price and the legal description. 4. Ad runs one time and you must wait ten (10) days after the ad is run to have the Judge sign the Order authorizing the sale. What is an example of asuccession under administration? 1. The net worth of the decedent is over $75,000. 4. Run two (2) ads 21 days apart then wait seven (7) days after the ad is run to have the Judge sign the Order authorizing the sale. Independent Administration is another possible way to open the succession of a decedent. Independent administration can be provided for in a will or all heirs must concur with the appointment of an independent administrator and dispense with the posting of security and/or bond. The beauty of independent administration is that once you have obtained the Letters of Independent Administration, you do not have to run ads as required by law when a succession is opened under regular administration. What are the duties and powers of the succession representative? What determines inheritance when there is no will? Inheritance depends on a number of factors, including if the property in question was held by the deceased as a community or separate property and also on the relationship of survivors to the deceased. Are there any caveats about inheritance in intestacy? Adopted children are entitled to full rights as legitimate children, and can inherit from natural parents and relatives. Illegitimate children are entitled to inherit to the same extent as legitimate children only if they are formally acknowledged or if they timely establish filiation. What is unique about separate property? In general, without a will, a spouse inherits none of the other spouse’s separate property. Instead, it goes to the children or blood relatives of the deceased. What is unique about community property? Parents in Louisiana are obligated to leave a minimum of 25% of their wealth to their offspring if they have only one child and 50% if they have 2 or more children. However, if the offspring has attained the age of 24 years and is mentally and physically capable of taking care of themselves and administering their estate at the time of the decedent’s death the parents can eliminate them from inheriting. The successor is liable for debts of the estate, but liability is limited to the value of the property the heir actually receives, valued at the time of receipt. The successor may accept or reject succession, cannot take the good and leave the bad. What options does a successor have? How does full acceptance occur? 1. All successors are presumed to accept. 2. A person cannot accept until the succession is opened, i.e., after the person dies. 3.1. Formal express and in writing or a judicial proceeding. 3.2. Informal is an act that implies intent to accept. 3.3. For Instance an act of ownership such the alienation or lease of inherited share. 4.1. The successor is liable for the debts of the estate but liability is limited to the value of the property the heir actually receives. How does partial acceptance occur? 1. An heir can accept an inheritance but renounce the rights that arise from someone else’s renunciation. 2. Conversely, the heir can renounce the inheritance but except the rights that arise from someone else’s renunciation. 1. According to the testament and if no “governing provision” as if the renouncing legatee had predeceased the testator. a. Can prohibit renunciation at least to the extent of the renouncing heir’s debt. What is an unworthy heir? What is inheritance by testacy (will) succession? 1. In addition to the proper form, the testamentary intent is needed. Did the deceased intend to convey property at death in the manner indicated in the will? What are donations and wills? a. Donation Inter Vivos – donor divests himself irrevocably in favor of a donee who accepts. b. Donation Mortis causa – action that takes effect on death and is revocable until death. a. Olographic will – testator must write the will by hand and date (example, January 2, 2009) and sign it. b. Notarial Testament – may be written, printed and typed; must be executed before a notary and two competent witnesses. How does one revoke or modify a will / testament? How does one revoke a provision of a will?